I've written about my conversion from New Year's Resolution curmudgeon to enthusiastic espouser of setting intentions every January 1st. Every year, I sit down with my family and we make a big "Hopes and Dreams for 20XX" poster. Stay away from our devices when we are with each other. 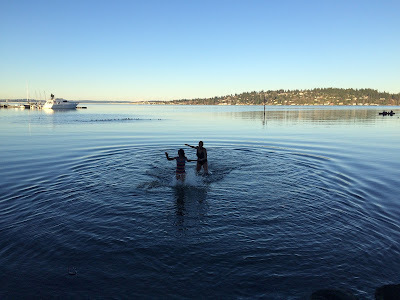 Another New Year's tradition my daughter Lucia and I have every year is to do the Polar Bear Plunge in Lake Washington. In past years, a whole gaggle of friends has rallied to do the plunge, but this year that group energy wasn't there. Lucia and I planned to do it anyway, but on the morning of, when it was 31 degrees, we decided to bag it. "Too cold," we both agreed. Later that day, Nancy, Lucia and I were taking a walk along the lake. Lucia did not want to take a walk and was cranky. She'd had a sleepover the night before and suffered the expected sleep deprivation hangover. But the day was gorgeous and we prevailed on her to join us. We could see Mount Baker and Mount Rainier. Coots and cormorants were having parties all over the lake and the sun was brightly shining. It was about 3:30pm when Lucia turned to me with a genuine smile and said, "Mom, I think we should do the plunge." Seizing the moment of Lucia's mood change, I said,"Yes! Let's do it!" and we ran home to get our bathing suits before the sun went down. It happened quickly. We changed into our suits, put our bathrobes, wool hats and flip flops and drove the one block to the lake. Nancy and our four-year-old neighbor waited on shore with our robes and Lucia and I ran in together and dove in. As we ran out, freezing and happy, our excitement, joy and pride was palpable. More than the frigid water itself, what I will remember from this year's plunge with Lucia is the moments right before and immediately after. That glimmer of time when Lucia felt moved and motivated to plunge and she got me on board with her was so thrilling, so connecting, so satisfying. When when we got out, wrapped up in our robes and hats and ran home to get into warm baths, we shared the thrill of accomplishment, of living one small dream together. Those spontaneous moments, "Let's do the plunge!" moments come all year round, in big and small ways. I tend not to be open to them, not to look for them or see them, but this year I'm going to try. I can already see the little opportunities. "I feel like chopping off all my hair" was a big one for me this week. "I'm going to make a huge vat of granola" was a smaller one. It comes everyday when I make the choice to do Yoga (or not). There's always a choice, always a moment before, to go one direction or the other. And then there's the moment after, that exciting feeling that comes from listening to the whispers of your hopes and dreams.